Pomegranates are available in the United States from September through December. Select fruit that is heavy for its size with bright, fresh color and blemish-free skin. 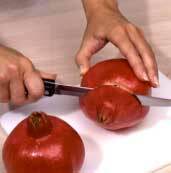 You can refrigerate whole pomegranates for up to 2 months or store them in a cool, dark place for up to a month. Pomegranate seeds packed in an airtight container and stored in the freezer will keep for up to 3 months. Pomegranates are a versatile fruit and can be used as a garnish on sweet and savory dishes or pressed to extract the juice. 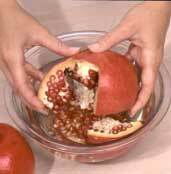 To use a pomegranate, cut it in half and pry out the pulp-encased seeds, removing any of the light-colored membrane that adheres. The juice can stain your clothes so be sure to wear an apron or clothing that you don’t mind getting stained. 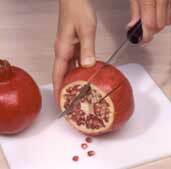 Step 1: Cut the crown end of the pomegranate. Step 2: Lightly score the rind in several places. 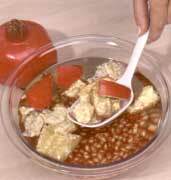 Step 3: Immerse fruit in a bowl of water and soak for 5 minutes. Step 4: Hold fruit under water and break sections apart, separating seeds from membrane. Seeds will sink while rind and membrane float. Step 5: Skim off and discard membranes and rind. Step 6: Pour seeds into a colander, drain, and pat dry. Sprinkle pomegranate seeds over salads, or desserts. Use pomegranate extract in marinades or as a glaze for poultry. 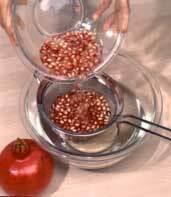 Use pomegranate seeds as a garnish on rice dishes, potatoes, and applesauce. Eat pomegranate seeds by the handful — like tiny berries. Top waffles, pancakes, or ice cream sundaes with pomegranates seeds.